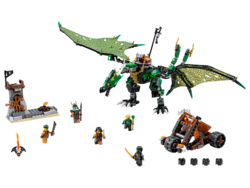 70593 The Green NRG Dragon is a Ninjago set released in 2016. Battle the sky pirates with Lloyd's awesome flying dragon! Place Green Ninja Lloyd on the saddle, grab the chain reins and launch into the air. Flap the Green NRG Dragon's huge wings to fly high and attack the sky pirates' lookout tower with its snapping mouth and dangerous talons. Swerve through the air to avoid shots from the pirates' mobile catapult and fire back with the stud shooters in the dragon's tail. Team up with Ghost Cole to triumph over Battle Doubloon and his crewmates and claim the Djinn Blade! Includes 5 minifigures: Lloyd in Skybound outfit, Ghost Cole in Skybound outfit, Bucko, Cyren and Battle Doubloon. Lloyd's Green NRG Dragon features a saddle for Lloyd, golden chain-style reins, posable head with translucent orange eye elements and snapping mouth, foldable printed textile wings with spike details, posable legs, talons, and posable split tail with 2 stud shooters. The sky pirates' lookout tower has a flag, hidden barrel with 2 golden coin elements, and a campfire with a translucent flame element. The sky pirates' catapult includes 3 turning wheels and 4 round 2x2 LEGO® bricks for ammunition. Weapons include Cole's golden sword, the sky pirates' sword, standard sword, spear and the Djinn Blade. Includes a lantern accessory element. The Green NRG Dragon measures over 5” (15cm) high, 14” (37cm) long and8” (21cm) wide with folded wings, and 22” (57cm) wide with unfolded wings. The sky pirates' catapult measures over 3” (10cm) high, 5” (13cm) long and 4” (11cm) wide. Facts about "70593 The Green NRG Dragon"
This page was last edited on 9 February 2019, at 21:25.